As business ecosystems become more complex and global, the intricacies of supply chains are increasing, with a rapidly changing network of regulators, suppliers and customers. Trust amongst these stakeholders has become a precious commodity, especially along high-risk supply chains involving key resources. Businesses have an acute awareness of economic, environmental and societal challenges associated with their operations, but are often at times restricted by fiduciary and operational responsibilities. There is a need to take stronger actions in mitigating the detrimental impacts. This is so especially with increasing regulatory requirements for transparency as well as consumer demand for ethical products. Diamonds and gemstones mining, as well as raw materials extraction and processing, are some operations that still have rampant instances of modern-day slavery, poor health and safety conditions, as well as environmental destruction. How can businesses ensure the responsible and ethical integrity of their supply chains efficiently? A need for inclusivity will require solutions that are efficient, efficacious and accessible. The use of emerging technology, in particular, blockchain technology, has the strongest potential in addressing this. A distributed database that maintains a continuously growing list of records called blocks, it acts like a digital ledger. The core characteristics of blockchain – immutability, security, speed and scalability – can enable the solutions required, ideal for traceability requirements. Information encrypted on the blockchain cannot be modified. Decentralised by nature, the system is highly secure. New information can be quickly updated across all blocks. Importantly, the scalability of blockchain allows data to be encapsulated across various industry applications regardless of size. Provenance is crucial for transparency in the business environment. The lack of being able to identify and track an asset’s provenance, caused by opaque supply chains, is detrimental as there is no way to determine its authenticity. This may lead to significant financial losses and cost businesses considerable goodwill. As assets move along the supply chain, the use of blockchain allows them to be tracked permanently. The transactional data proves the provenance and is accessible to all relevant parties from the one single orchestrated source of information. A visible and auditable trail is created, ensuring full transparency to create an ecosystem of trust amongst stakeholders. This traceability solution can be applied across numerous industries globally. Identifying this innovative frontier and developing its full potential will create new business models. Full transparency provides confidence in legitimate operations, enabling greater access to finance, and exposes illicit practices. Combining other technologies can extend its use beyond data storage along the supply chain. One key impact of traceability is the potential to enable responsible and ethical supply chain practices, which will lead to the setting of sustainability standards. Business operations along a transparent supply chain can be confidently checked against various regulations and conventions as data integrity is maintained on the blockchain. There is a clear importance for such traceability solutions in industries that involve mining and processing, from diamonds to minerals such as cobalt and tantalum. Unfortunately, the trade of resources mined from conflict zones is still a key global issue. These conflict resources directly fund rebel groups and fuel war, with their mining and production activities often involving serious human rights violations. Tracking a diamond’s provenance on the blockchain drives full transparency along the supply chain. From the diamond’s conflict-free origins through to retailers, each process is encrypted on the blockchain, providing verification of its authenticity and ethical sourcing. The Kimberley Process Certification Scheme was set up to regulate trade in rough diamonds, stemming the flow of conflict diamonds. It has been implemented across the industry, but like any paper-based process, it has gaps. Its recent digitisation on the blockchain has facilitated it into a more efficient process. serious labour violations.A wave of measures has been implemented for companies to exercise due diligence and to eradicate such violations. They include the Dodd-Frank Act, OECD Due Diligence Guidance, UK Modern Slavery Act and the California Transparency in Supply Chains Act. There is a strong requirement to comply with governance standards for these resources that may fund conflicts. Provenance tracking will create a clear audit trail, pushing companies to be aware and take action to comply with these measures. They are able to demonstrate clearly responsible and ethical operations, in a cost and time efficient manner. In a circular economy, products are created with multiple life cycles in mind to minimise or eliminate waste and recover resources. However, it is integral for these systems to be managed and regulated in an inclusive way for all regions and industries. In particular, recycling needs to be structured, especially in developing countries to where a lot of waste is sent. Informal recycling is common in these countries, which can cause environmental and social damage. Applying blockchain across these recycling processes will ensure proper action as there is transparency throughout. Blockchain can validate the entire process from collection to manufacturing, proving compliance with sustainable guidelines and recycling certification schemes. The need for a way to develop and manage these complex supply chains properly has never been more crucial. Fragmented systems must be harmonised to close any gaps that can allow criminal activity. 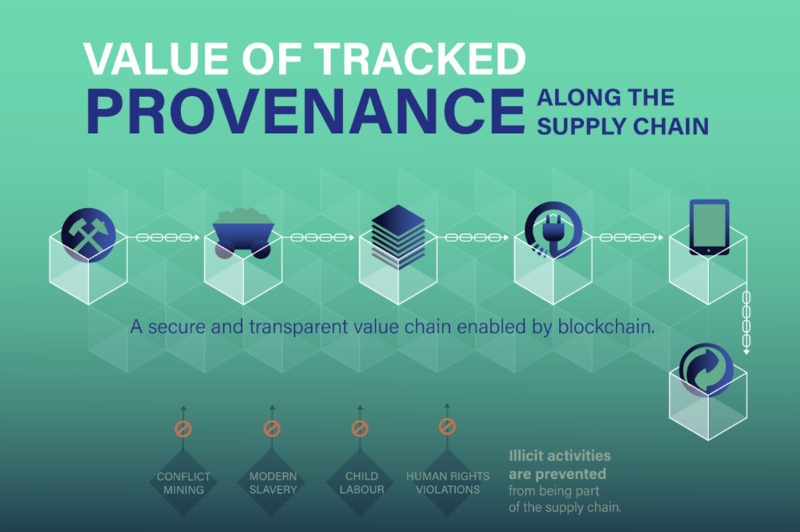 The use of blockchain technology for provenance tracking can offer new levels of transparency and standards which are highly beneficial for all stakeholders – enabling greater prosperity to societies and contributing towards a more sustainable future. With this innovative way paved for businesses and governments to work together, the positive blockchain impact on social good can only get stronger.